7. Pour the batter into a greased round cake pan and bake in oven for about 30-40 minutes or until a toothpick inserted comes out clean. Remove the cake from the pan after about 15 minutes and allow cooling completely. 1. In a large glass bowl whisk the eggs whites and lemon juice until almost stiff. 2. Add the powdered sugar at a low speed for about 4-5 minutes and then gradually increase the speed to medium until the icing is white and shiny. 3. When the white icing is ready take 3 tbsp aside in a piping bag, before adding the cocoa powder to the rest of the icing. 2. Take the white icing and start piping from the center of the cake and draw a spiral on the cake until reaching the edge of the cake. 3. Use a toothpick to draw lines from the center down to the edge of the cake. 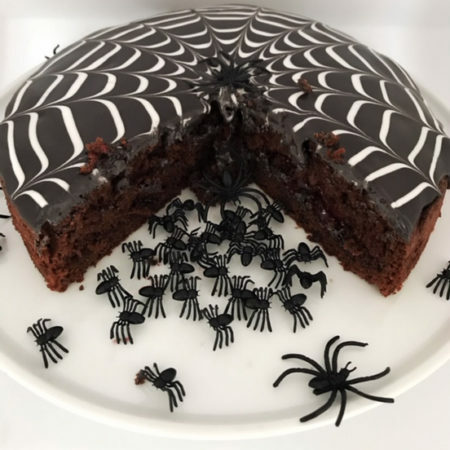 PS: I placed a few plastic spiders for decoration only but please remember to remove them before eating the cake.